To supplement and give teeth to the strict but ineffectual legal regime now in place, economic thinking, and basic public policy research suggests it would be helpful to institute a “pollution tax” on antiquities purchased by residents of “market” countries. Such taxes—imposed on such transactions in goods like tobacco, gas, coal, etc.—are designed to internalize the social costs of economic activities so that the polluting industry either takes measures to clean itself up or pays the government to prevent or mitigate the harm the industry causes. 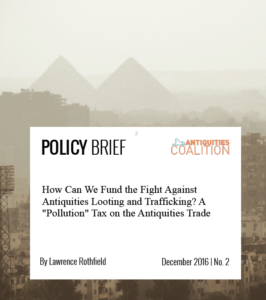 An antiquities tax, tailored to fall more heavily on antiquities with weaker provenance or extremely high prices, and channeled into an antiquities-protection “Superfund” (as was done to clean up toxic chemical sites) or via existing governmental agencies, could provide a sustainable funding stream to pay for more robust monitoring and enforcement efforts against the illicit market and for better site security. Such a tax is likely to face substantial resistance from both dealers and archaeologists, but it is suggested that the concerns of both sides could be dealt with through sustained discussion and negotiation.